Under the new code of functioning, the Punjab Director-General of Police, Mr A.A. Siddiqui, has directed senior officers to make their security arrangements less pompous and a quiet affair. The DGP said the unnecessary display of security cover by officers, particularly in the field, led to public resentment and should be avoided. 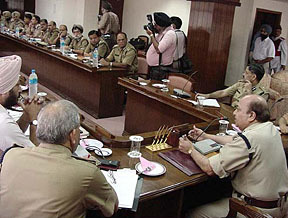 The Punjab DGP, Mr A.A. Siddiqui, presides over a meeting of the top brass of the Punjab Police in Chandigarh on Saturday. With the inquiry into the Employees Provident Fund scam in the Ropar Thermal Plant nearing completion, embezzlement has been detected in the EPF accounts of contract labourers serving in the Lehra Mohabbat thermal plant of the PSEB in Bathinda. More than 20,000 residents have not been paying water supply bills worth crores. Commercial establishment owners, industrialists and residential premises measuring over one kanal were not responding to the Municipal Corporation’s drive to install water and sewerage meters in such units. Orders for releasing Munir (13) were received by the District Collector, Mr Ram Avtar Raghuvanshi, at Sriganganagar, 40 km from here, last evening. A police party from Kesarisinghpur has been asked to get Munir released from Borstal jail, Bikaner, to take him to Rajasthan House, New Delhi, for completing formalities to ensure that the boy is handed over to the Pakistan Embassy for sending him back to his home through Wagah border on Tuesday. The police here unearthed a factory making country-made revolvers in Hanumangarh (Rajasthan) on Friday evening and arrested six persons running the factory. Six revolvers and four cartridges were also recovered. Ms Mohsina Kidwai, general secretary, All-India Congress Committee and in charge Punjab affairs ruled out change of state leadership over differences between state Chief Minister Captain Amarinder Singh and Ms Rajinder Kaur Bhattal, here today. Three years after news reports detailed the tragedy which befell Sunita Devi when her husband was stomped to death by a bull and one year after the Punjab Human Rights Commission recommended that she be considered for employment by the Municipal Corporation, the widow has received a rude shock. Activists of the All-India Anti-Corruption Forum, led by its president, Mr Gurdip Kang, held a demonstration against Coca Cola and Pepsi companies and smashed bottles of these two brands of beverages in protest against the alleged presence of pesticides and insecticides in these soft drinks and 10 other brands, according to the findings of an NGO. Under its one-day drive, the district administration, in collaboration with gram panchayats, non-government organisations, district departments, students of schools besides members of senior citizen clubs, disabled children of Umang and Ujala institutions of the District Red Cross Society and members of the hospital welfare section, planted over 60,000 saplings of different varieties in the district today. Proceedings of the defamation case filed against former Chief Minister of Himachal Prem Kumar Dhumal in a court here have been stayed by the Supreme Court. Members of the Guru Kirpa Housing Board Colony Association has urged the state government to order a vigilance probe into the role of local Municipal Corporation officials and promoters of Chadha Builders in the alleged composition fee scam running into lakhs of rupees. The local municipal council authorities have chalked out a plan to spend Rs 3.5 crore on various development works to provide basic amenities to the residents of the town. The Municipal Town Planner and two other municipal corporation officials were allegedly assaulted by some shopkeepers, owing allegiance to a Congress minister, to prevent them from sealing an illegal shopping complex at the Modian mohalla, here today. Amrinder Singh, a Punjab Police constable posted in the Police Lines here, was today caught red-handed while he was accepting bribe of Rs 5000 from Mr Ashwani Kumar, a video parlour owner of this city for helping him in a complaint against him to the police Mangat Rai Goyal, district manager, Book Depot of the Punjab State Education Board, who was caught red-handed while accepting bribe in 1993 was sentenced to jail for one year and fined Rs 1000 as special judge, Jaspal Singh today. The Punjab Vigilance Bureau today filed a chargesheet against former Chief Warden (Zoos) Dr Vinod Sharma and three others in a case pertaining to the purchase of meat for Chhatbir Zoological Park and as recycling of tickets. Members of the Punjab State Aided School Teachers and Other Employees Union today held dharna in front of the residence of Punjab Revenue Minister Amarjit Singh Samra to protest against the failure of the state government to accept their long-pending demands. Mr Manjit Singh Calcutta, honorary Chief Secretary, SGPC, today said that the attitude of the Congress government towards SGPC-run state institutes was discriminatory.